When a parent says “clean the bathroom” they have something very specific in mind. They want to see smooth counters, a sparkling mirror, hair-free floors and a pristine toilet. When a child hears “clean the bathroom” they have a vague impression that they are supposed to take the cleaner and spray as much as they can, and then take a rag and wipe as much as they can, and when their arm feels like it is about to fall off then they are done and it is time to play. Let’s just say that for children, cleaning the bathroom is not intuitive. Over the years I have had many informal training sessions with my kids, teaching them how to keep the mirror streak-free and how to keep the counter from getting sticky and to always remember that little forgotten ledge at the back of the toilet. But even after all this, when I told the kids to “clean the bathroom” it never seemed to meet my hopeful expectations. Sometimes the bathroom looked worse after they had “cleaned” it than before. I have realistic expectations, I know they are children and that they shouldn’t be expected to clean as well as an adult. And that I should keep my standards low.
. . . or should I? In my heart I had a hunch that they could do a really good job on the bathrooms if they wanted to, and if they had a clear understanding of what “clean” really meant. Plus I wanted the child, whatever her age was, to feel success for whatever level of cleanliness she achieved. And if she went the extra mile I wanted her work to be rewarded. So this summer I introduced the idea of Blue Ribbon Bathrooms. This is based on the concept of Good, Better, Best. This way they can see that there are different levels of clean, and all levels are rewarded respectively. I assigned each child a bathroom for the entire summer. This was important, since this would be her bathroom to take care of. The better she cleaned her bathroom the first week, the easier it would be for her to clean the next week and so on. Naomi gets the half-bath since she is younger. 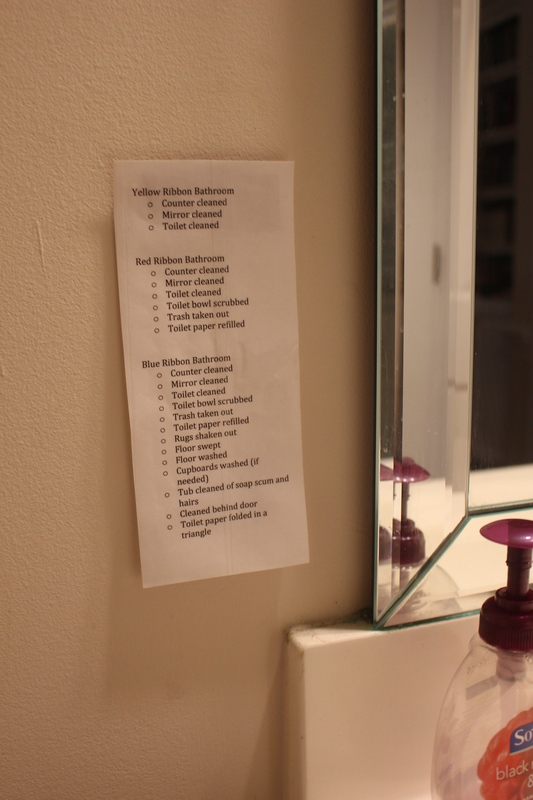 I made a list of what I felt like was a Good cleaning job, a Better cleaning job and a Best cleaning job, laminated it and stuck it on the wall in each bathroom. The full, readable version is printed at the end of the post. Then I gave them incentives to match their results. 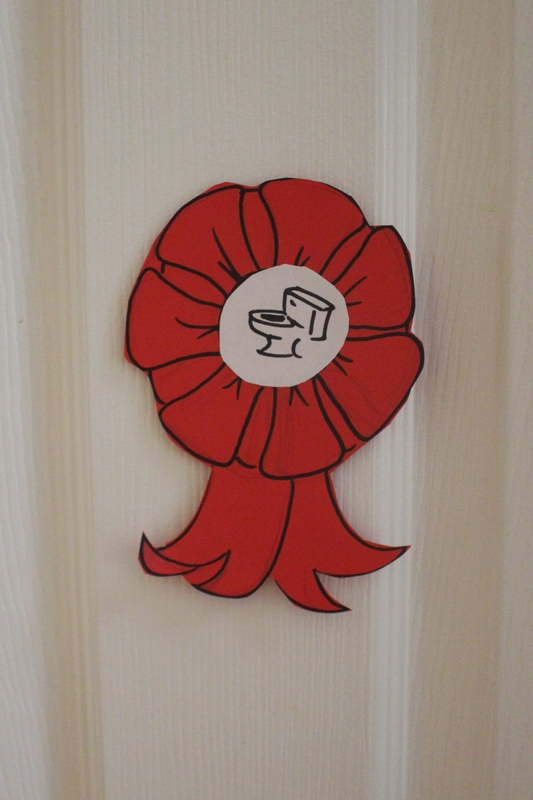 The first incentive was that they got a “ribbon” on the door to show the world what level of cleanliness their bathroom had obtained. I couldn’t find ribbons at the store with toilets on them so I had to resort to my own trusty pen, paper and scissors. The second incentive was that they got stickers that could be traded into cash at the end of the summer. A Blue Ribbon bathroom would receive 20 stickers, a Red Ribbon bathroom got 10 and a Yellow Ribbon bathroom got 5. (These stickers were part of a much larger incentive program that also included getting stickers for instrument practicing, book reading, and other chores that lasted the entire summer. Each sticker, at the end of the summer, could be traded in for 10 cents each. But you could use other incentives, too.) The third incentive was the most important: if they cleaned their bathroom well, than the next time they had to clean it it wouldn’t be so hard. The better they cleaned, the less they would have to clean in the long run. This was what I really wanted to teach them. Even if the kids settle for doing a yellow or red ribbon bathroom, I am still happy. This system has worked great this summer (although not perfectly) and so far it has been the best way to help them understand the difference between a dirty bathroom, a clean bathroom and a spotless bathroom. 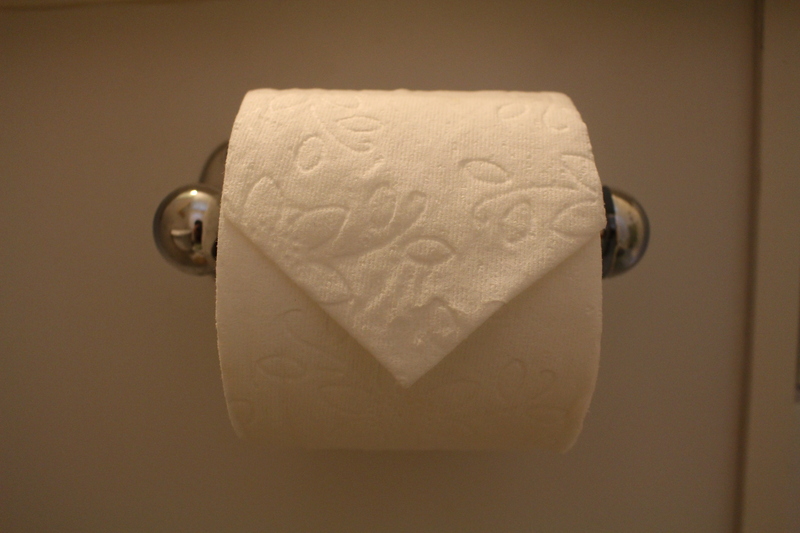 Best of all, when a bathroom has really been cleaned, from the faucet all the way to the folded triangle in the toilet paper, and the Blue Ribbon has been placed on their door, I can see the pride that they are feeling, knowing that they went beyond Good or Better but they did their very Best. Great list. It is so easier to clean when there is a list. You could`t miss a thing. Thank you for sharing it. Best regards!